The Friday Night Rock Show interview with Andrew Peel ( Neebs). I would like to thank Steel Comb for taking the time to do an interview with us.Best of luck with the band. Neil - Hello how are you? Steel Comb - We’re all good, doing away. N - Can you tell me how long steel comb have been going? SC - We’ve been going for about 3 years on and off with a few change’s in our line up. N - have you had many line up changes and what is your current line up? SC - We’ve had a few changes. At first we where a 5 piece. Titch our first drummer left and then we got wee Ryan in. Magoo left for a while and Chris came in on the bass. Cloughy came in on guitar and we went to a 6 piece and Magoo joined us again. Danny and John Cameron left to start a new project and we where down to a 4piece. Cloughy left to do his own thing, so we where down to a 3 piece. Ally Oi! Guitar/vocals, Magoo Bass & wee Ryan drums and that’s the way it’s stayed for the last year. N - Have you played many gigs and have you any memorable gigs? SC - We’ve done 25 gigs. Our first gig was with On file, Rotten apples in Glasgow. Our most memorable gig was at the Classic Grand in Glasgow with The Last Resort, 4 Past Midnight, Runnin Riot and The Cundeez. We where on first and it was Ally’s First gig doing all the vocals, we played really good that night but all the bands where top notch. Last Resort where Brilliant. N - Have you done many recordings and where can fans get a hold of steel comb music? SC - We done a 4 track Ep called 1982 on vinyl from Telstafz records (Germany) when we first started. We went into the Studio in January 2014 and recorded 6 tracks. The first track Backstabber was put on the Bathgate belongs to us compilation cd (100% British Oi! Productions) which came out in March 2014, our next release will be on a split called the New Breed with No Quarter, Queensberry rules and Adverse Society. Each band has 4 tracks each. This will be out on the 13th June at the Bathgate weekender. There’s another track coming out on a charity compilation later on the year but we haven’t got details yet. N - Have you got any gigs coming up? SC - We had a few but a couple of them got cancelled. So our next gig will be Friday 13th June at the Bathgate weekender but hopefully we’ll get a couple before then. N - What bands have influenced steel comb? SC - The 4 Skins, Last Resort, Blitz, Menace, The Business. Any old school Oi! N - How would you describe steel combs music? SC - Old school oi! That’s the sound we try for. It’s what we grew up listening to. N - You travel a lot to play long distance gigs you must love playing live music? N - Do you think oi music is on the way up? SC -To right it is. There loads of new bands popping up like No Quarter, Queensberry Rules and Brass Knuckle. Then there’s all the old bands getting back together as well. So the oi! Scene is healthy as it been in years. N - What do you think of bands who say they won’t play with other bands because of some stupid difference like they’re a skin band or something daft like that? N - Has steel comb always been a skin band? 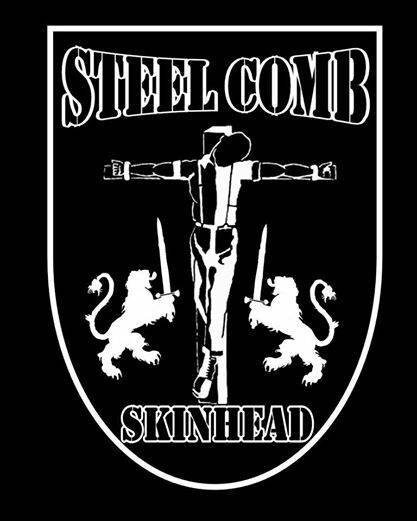 SC - We’ve always been a Skinhead band from day one. Our drummer Ryan is not a skinhead, he’s a metal head but he loves playing in Steel Comb. N - What plans have steel comb got for the future are you planning studio recordings, live playing, and festivals? N - are there any new bands coming out of Edinburgh that are oi that you would like to mention? SC - Aye, there’s a couple. 2 of our old band members. John and Danny Cameron started Brass Knuckle and then there’s Last stand. N - Do you think in Scotland that there are more east coast oi bands than west and if that’s the case why do you think that is? N - What does oi music mean to you? N - What musicians have influenced you? SC - Anyone who just picks up there instrument and makes a noise and sticks there middle finger up at the world. N - What would you like to say to the world about steel comb? SC - I don’t think we’d do t in the park, commercial pish!!! But we’d do the Wickerman Festival if we where asked. N - finally I would like to thank you for taking the time to do this interview is there anything you would like to say to the fans of oi and your own fans which are loyal to you? SC - Keep supporting the oi! Scene and your local oi! Bands. To the fuckers who go to the polis and newspapers to get our gigs cancelled, get it right up yi , you’ll never stop us. N - This is the final one what are your top 20 songs of all time? Thanks very much mate. And all the best with the band.